Some aerial views the places I was stationed at in the Air Force. If anyone has any pictures of any of these places I would greatly appreciate any of them. You can send them to my e-mail link below. 3345th Security Police Squadron, Chanute AFB, ATC, 1977-1980, E-1 - E-4, Gate Guard, Patrolman, Desk Sergeant. 8th Security Police Squadron, Kunsan AB, PACAF, 1980-1981, E-4, Gate Guard, Patrolman, Desk Sergeant, Customs Inspector. 3345th Security Police Squadron, Chanute AFB, ATC, 1981-1984, E-4 - E-5, Patrolman, Desk Sergeant. 8th Security Police Squadron, Kunsan AB, PACAF, 1984-1985, E-5, Patrolman, Desk Sergeant, Assistant Flight Chief, Quality Control Law Enforcement Evaluator. 56th Security Police Squadron, MacDill AFB, TAC, 1985-1988, E-5, Patrolman, Desk Sergeant, Assistant Flight Chief, NCOIC Base Visitor Center, Investigator, NCOIC Investigations. 5071st Combat Support Squadron, King Salmon Airport, AAC, 1988-1989, E-5, Flight Chief (Joint Law Enforcement/Security Flight), NCOIC Investigations. 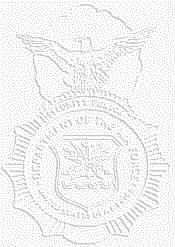 2750th, 645th and 88th Security Police Squadron, Wright-Patterson AFB, AFMC, 1989-1994, E-5 - E-6, Patrolman, Assistant Flight Chief, Flight Chief, NCOIC Pass & Registration. Kunsan Air Base History - There's even a bit on John! Check out my Not A Zombie products!